In retrospect, my formative experiences with comedy are improbably lucky. Growing up in Singapore meant living in a comedic wasteland. The best local sitcoms were the local dramas, and the foreign comedy we did get included censored versions of Friends—lesbian ex-wives were strictly verboten—and uncensored episodes of Petticoat Junction. Fortunately, the stuff holding my attention didn’t come from television but from VHS tapes surreptitiously mailed from the States. These tapes contained all the notable comedies of the age, and my friends and I would pore over them, watching the Seinfeld, fast-forwarding the Arli$$, and discovering between them this curious thing called South Park. It’s difficult to convey how strange the show felt back then, with its construction-paper visuals and its dedication to showing both feces and brains on-screen. Even the cadence of its language was unnerving. It was also hilarious, and I had a brief, youthful love affair with it. Today, South Park is television’s most unlikely elder statesman, a minimally animated cartoon of topical gross-out humor that will somehow roll into its 18th season this year. But watching it today—as I recently have, after a decade-long hiatus—it’s obvious why the show endures. Its sparse aesthetic has long acted as a shield, allowing it to push the envelope without constantly running afoul of Standards And Practices. It also makes possible South Park’s notorious weeklong turnaround schedule, keeping the show topical even as the news cycle has accelerated to breakneck speed. But South Park’s most valuable asset is the exuberance and intelligence of its creators. On its best days, an episode of South Park will run the gamut of humor, from fart jokes and broad parody to subtle satire and self-deconstruction. All of that is delivered with inhuman energy by the show’s creators-slash-voice actors, Trey Parker and Matt Stone. South Park: The Stick Of Truth brings Parker and Stone along for writing and voice duties, and with them comes the energetic, versatile comedy that has kept the show alive so long. The main character is a new kid of the player’s own creation. You’ve come to South Park to escape a mysterious fate and start anew. In this case, starting over means playing an expansive game of swords-and-sorcery make-believe with the local kids. Eventually, impossible events from the outside world encroach on this fun, and vice versa, until every person in South Park is invested in the outcome of the kids’ game. Video games, unsurprisingly, are the primary target for skewering in Stick Of Truth. Like the heroes in many other role-playing games, the main character is a mute amnesiac—and just like in the other games, the townspeople are happy to have one-sided conversations with him. (The game notes the strangeness of this trope.) Quick-time events, the reviled twitch-reaction moments that abstract complex actions into a single button press, are presented with winking irony. This is a game that bluntly says the use of Nazi zombies in games is lazy, and then makes them the primary enemy for hours, and then brings the concept to a grotesquely un-lazy place. There are also fart jokes. This is the whole South Park gamut. That the game is 15 hours long also gives the comedy a larger than usual canvas. Parker and Stone have taken advantage. Yes, there are one-and-done jokes, like unskippable video scenes made maddening by Jimmy’s stutter. There is fan service, mostly in the litter of collectible junk, Facebook friends, and Chinpokomon. But there are also jokes that simmer for an hour in the background of a level, only paying off in the outrageous boss battles that are this game’s finest moments. And a few jokes warm over gently for the entirety of the game, resulting in a hilarious closer. So it’s funny. But it’s also an enjoyable game, if an unambitious one. The turn-based combat is complex. Although it generously allows for one healing action and one combat action per turn, diverting your attention for even a single turn can result in missing a crucial quick-time event—which spices up the combat by adding bonus damage or reducing damage from an enemy attack—and losing the fight. That’s until you hit maximum strength, as I did several hours before the game ended. By that point, the many abilities and spells are so powerful that battles might as well not even be there. The Stick Of Truth also lets you explore the entirety of the town of South Park. It’s here that the show’s trademark minimalism becomes a weakness, making the world sparse and empty. By design, there’s not a lot to see here. The Stick Of Truth is a direct follow-up to last year’s “Black Friday” trilogy, but those episodes aren’t a prerequisite for enjoying this game. Watching some South Park probably is a prerequisite, however, and the more, the better. 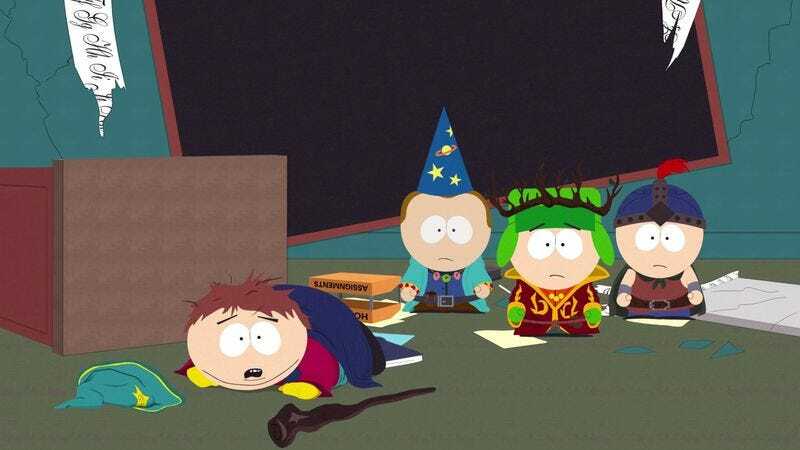 South Park: The Stick of Truth is South Park. Even coming back to it after years of not watching the show, there was something for me here. That something was good comedy, which is rare in games or anywhere, and never gets old. What game do you love despite knowing it’s terrible?